Out of all of the food in the world, precious few engender the cravings — and possibly the controversy — that pasta does. Why do people go wacky over these seemingly harmless noodles? Maybe because it’s a product of the passionate Italian culture, or food bloggers obsess over making the perfect batch of dough, or serious home cooks strive to fine-tune the formula for proper cooking. My half-Italian wife did all of the above in her last pasta-perfecting jag — she even bought one of those shiny, heavy metal pasta makers that comes with all of the different cutters for cranking out perfect little noodles, from fettuccine to tagliolini. The problem with all of that pasta love: The doughy dish can really sneak up on your waistline. It’s nothing a good workout regimen — ahem, say running an ultra-marathon every week — can’t keep in check, but for most of us trying to maintain sleek, lean physiques, it’s an indulgence that needs to come only every so often. But, let’s be real: Pasta is delicious, comforting, and a joy to eat. If you’re going to eat it, there are versions — some gluten-free, some made from vegetables instead of grains — that are healthier than the white or even whole-grain varieties. Thankfully, there are a bunch of ways you can tame those noodly cravings. One strategy: Try noodles made from chickpeas, black beans, and quinoa. “Pasta made with bean or pea flour is gluten-free, and will have more fiber and protein than regular pasta,” says Elisabetta Politi, M.P.H., R.D., L.D.N., C.D.E., nutrition director at Duke Diet & Fitness Center. We like Banza pasta, which is 90 percent chickpeas with some tapioca flour and pea protein mixed in, and Trader Joe’s has a great line of organic black bean pasta made from 100 percent black beans. “For those avoiding gluten, I recommend quinoa pasta,” says Politi. Some good brands to look out for include Andean Dream. Their quinoa pasta is mixed with organic white rice flour, and there’s also the 100 percent quinoa pasta from Pereg. But beware of what you buy. Some brands of veggie pastas aren’t that different than regular pasta; they’re just the same old white flour pasta gussied up with a dash of beet juice or tomato powder. These “fake” pasta alternatives are usually also higher in calories, fat, and sodium than pure pea or bean pasta. For a great spaghetti substitution, one of the best veggies to use is the aptly named spaghetti squash. The flesh inside is ropey and robust, so all you need to do prepare it is split the squash lengthwise, scoop out the seeds, brush with olive oil, and sprinkle with salt and pepper. Roast flesh-side down for 30 minutes or until soft at 400°F. Once cool, pull out the stringy flesh with a fork and add your favorite marinara and lean meat (or preferred protein). For a great all-around alternative, you can’t beat the humble zucchini. Usually relegated to soggy side dish status, the zucchini (and cousin yellow squash) comes alive when your pair it with a spiralizer. 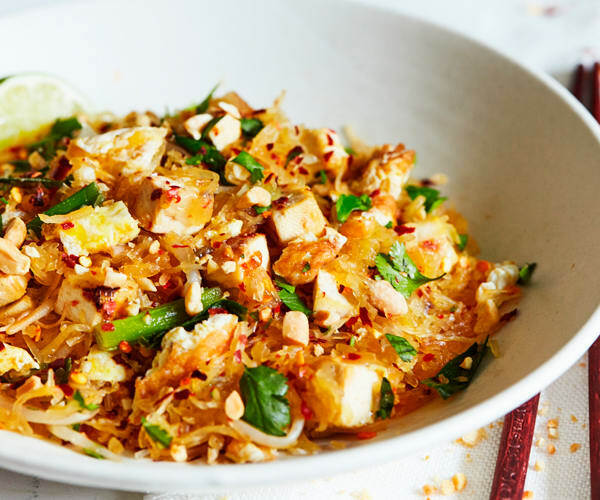 These handy gadgets quickly reduce a big zuke to a pile of delicate “zoodles” that you can then add to a wide variety of dishes, from traditional Italian recipes where noodles are called for to Asian-inspired noodle dishes like pad thai or lo mein. You can also try spiralizing all other sorts of veggies like beets, broccoli stems, butternut squash, cabbage, cucumber, and sweet potatoes; the possibilities are yours to create. Squash or even eggplant can be sliced into thin sheets to replace lasagne noodles when making that popular dish — you’ll never even miss the old way. Keeping your physique sleek and lean is not as tough when you can replace traditional pastas with more nutritious alternatives. 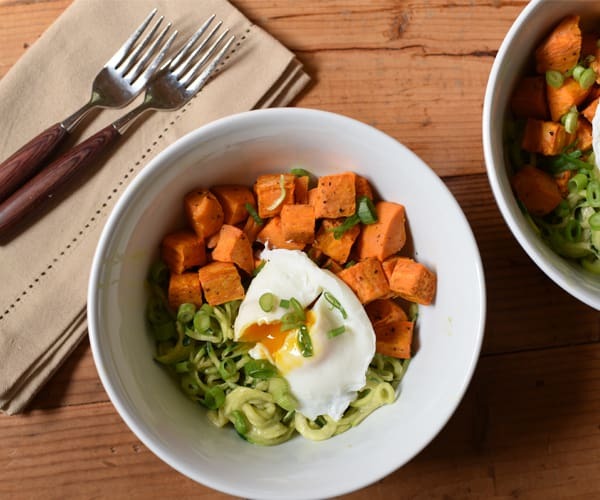 With a few simple adjustments to your grocery list and diet, you can still get the slippery, smooth feel of primo pasta with bean and pea alternatives, or go even lower in calories while upping the nutrients with veggie analogues. Indulge your pasta cravings after a tough cardio day or long run, and your waistline will show the results; it’s worked for my pasta-crazed wife and I. On other days, zoodles can suffice as a more benign delivery vehicle for tasty sauces. Oh, and that cumbersome, kitchen cabinet–space taking pasta maker? We sold it last year at a garage sale for $5 and replaced it with a light and lean spiralizer.